Son of Rehob, and King of Aram-zobah, who, while he was on his way to establish his dominion on the Euphrates, was defeated by David, suffering great loss in chariots, horses, and men (II Sam. viii. 3-12; I Chron. xviii. 3, 4; I Kings xi. 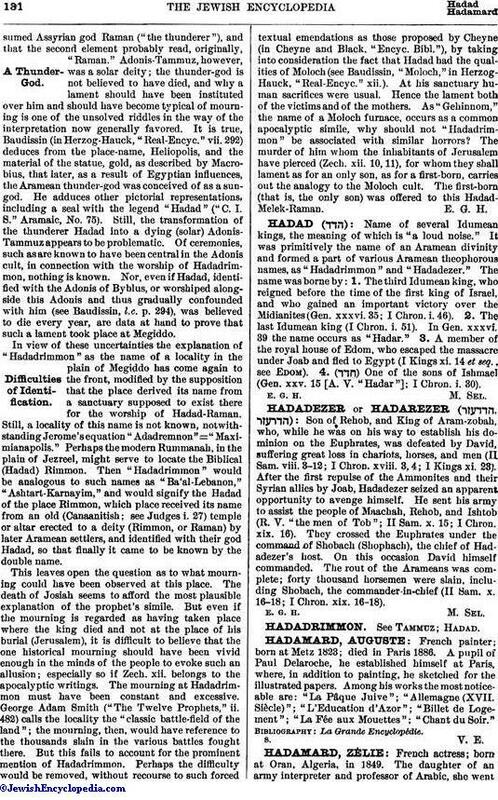 23) After the first repulse of the Ammonites and their Syrian allies by Joab, Hadadezer seized an apparent opportunity to avenge himself. He sent his army to assist the people of Maachah, Rehob, and Ishtob (R. V. "the men of Tob"; II Sam. x. 15; I Chron. xix. 16). They crossed the Euphrates under the command of Shobach (Shophach), the chief of Hadadezer's host. On this occasion David himself commanded. The rout of the Arameans was complete; forty thousand horsemen were slain, including Shobach, the commander-in-chief (II Sam. x. 16-18; I Chron. xix. 16-18).